This Learning Disabilities Mortality Review (LeDeR) report, published by NHS England and the University of Bristol makes informative, but depressing reading in what it reveals about the shortened life expectancy of people with a learning disability but also about the impoverished lives lived by this same population during and up to death. People in relationships: of all those who died and were reported to the inquiry, 96% of those were single – estimates for the general population suggest one third of adults are single (Office for National Statistics 2017). Own home: yet despite being single, only 9% lived in a home on their own. Away from home: equally disturbing, and despite the Transforming Care programme, nearly 10% of the learning-disabled population are still in out of area placements. Place of death: only 30% of those reported died at home whereas for the general population this is 50% and the aim is for it to be 70%. What can we as health professionals do to change things? We can ensure people with a learning disability have a health passport and that hospitals use them. We can try to stop people being discharged without adequate support in place, where they are being discharged too. We can look at take-up rates for hospital and GP appointments to ensure that arrangements are in place to ensure all necessary reasonable adjustments have been made to optimise the likelihoods of attendance. We can end the waste of money the Transforming Care initiative has been and use the funds released to invest in services locally for people with complex needs. If we want people to live close to home then the level of support in the community must be at least equal to, and hopefully better than, they would get in an in-patient unit. It’s ridiculous to expert minimum wage support staff to be able to provide the same level of support that a multi-disciplinary team in an inpatient unit can without daily input from a community team. Also, we can advocate for joint health and social care funding and stop the vast waste of resources that deciding on NHS continuing healthcare funding is all about. If someone needs healthcare then get on with it, don’t spend days deciding which pot of money is used. However, there is a far bigger issue that needs to be tackled. People with a learning disability have poorer health than the general population and need specialist support, we have ample evidence of this. So, why then are the numbers of specialist learning disability nursing posts continuing to be reduced? Even more worrying, why are the universities scraping learning disability nurse training courses? The government needs to take urgent action, as urged by the Royal College of Nursing’s Annual Congress in Belfast, to address this disaster. While at congress I visited the Titanic museum. I was reminded that being a learning disability nurse is akin to being a crew member on the Titanic. 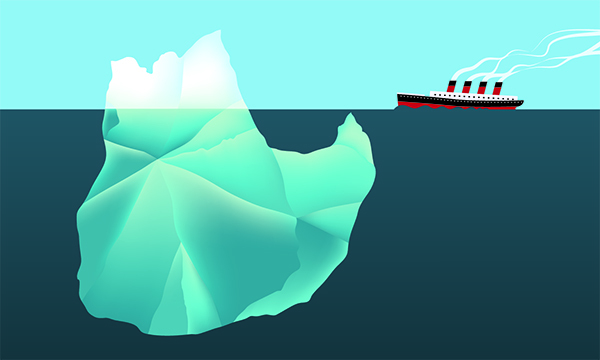 The difference being that this time we can see the iceberg coming.